KANDU Industries Inc.Gary Bersell Receives A-Team Advocacy Award - KANDU Industries Inc.
On Wednesday, October 24th, A-Team Wisconsin visited KANDU to educate members and advocates about the importance of voting and to honor KANDU Executive Director, Gary Bersell, with the Advocacy Award. 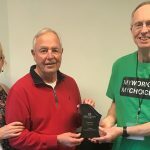 This traveling trophy is awarded every 6 months by Disability Services Providers Network and presented by A-Team to individuals who have excelled in the area of advocacy for those participating in Wisconsin prevocational programs. In honor of National Disability Employment Awareness Month, A-Team Wisconsin has been touring community rehabilitation programs and meeting with grassroots self-advocates and families throughout the state. Members and advocates are encouraged to write a short email to Seema Verma, Administrator of Centers for Medicare and Medicaid Services (CMS), and inform her that you support prevocational programs offered by Community Rehabilitation Programs like KANDU. CMS has issued policies that may be adverse to prevocational programs and it is important that we continue to advocate for their future longevity.